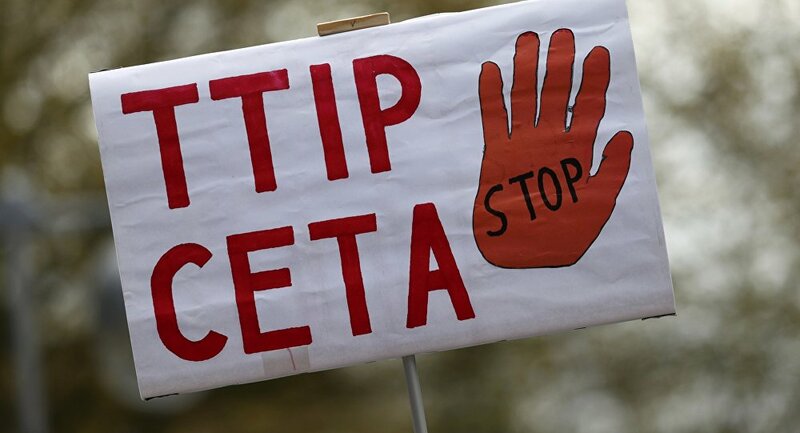 About 8,000 people joined the demonstration in the capital of the Netherlands against the the EU-Canada Comprehensive Economic and Trade Agreement (CETA), showing their support for the Belgian region of Wallonia's resistance to the deal, media reported Saturday. MOSCOW (Sputnik) — According to the the Belgian television broadcaster RTBF, about 8,000 manifestants flooded Amsterdam's Museumplein declaring their support for a small French-speaking region in Belgium that refused to give its approval to the trade deal, effectively halting the talks between EU and Canada and putting at serious risk the future of the deal, originally scheduled for signing on October 27. — Meltem Okcu (@MeltemOkcu) 22 октября 2016 г. "The Walloons led a fundamental argument and decided, like all of us, that the deal was not good yet. We are grateful to the Walloons. Through their resistance, we can continue to make our case for the truly honest and durable trade to the Netherlands," Jurjen van den Bergh, the organizer of TTIPAlarm movement, said in a statement, as quoted by RTBF. — De Lange Mars (DLM) (@delangemars) 22 октября 2016 г. ​Earlier today, European Parliament President Martin Schulz held separate emergency meetings with Canadian Trade Minister Chrystia Freeland and Walloon Premier Paul Magnette, which did not seem to lead to any concrete results. Magnette said, following the meeting, that the EU countries would still need to iron out the details of the trade agreement. CETA aims to establish a free trade zone between Canada and the European Union, erasing more than 98 percent of the existing tariffs between Canada and the European Union. Opponents fear it would undermine standards and regulations on environmental protection, health, safety and workers' rights.